The Trans-KTP 17, 22 and 27 T tipping trailer models are conceived and designed for the hardest works. Given their sturdy design, their body with side walls and floor fully made of 6 mm HARDOX 450 (5 mm for 17/50) ensures their long life span. The double-axle models are standard fitted with the JOSKIN Cross-Over bogie and the 27/65 TRM with the Hydro-Tridem hydraulic suspension. These running gears ensure a high driving comfort on uneven ground. Furthermore, the 27/65 TRM is standard fitted with a double self steering system (first and last axle), which further improves the manoeuvrability. All these models are also standard fitted with a bumper that retracts hydraulically as the door opens. 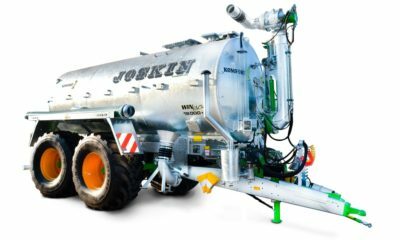 JOSKIN developed a narrow chassis that allows to fit the Trans-KTP with wide wheels (up to 666 mm), while not exceeding a total width of 2,550 mm. It also provides a larger steering angle and can be fitted with a more efficient braking system. With the front cylinder, the safety and stability of the vehicle are as effective as in standard position. The telescopic tipping ram is mounted on a double oscillating frame fitted with greased bearings and integrated in the chassis at a more forward position. This system compensates the torsions due to the tipping strains and effectively protects the ram and body from distortions. The body tipping is also ensured by the two robust hinges including bolted axis with large diameter. The back- and upwards position of the hinges increases the unloading height. Standard mounted, a safety valve, which is directly placed on the tipping ram, prevents the body from unexpectedly falling down (e.g. when hydraulic hoses break). 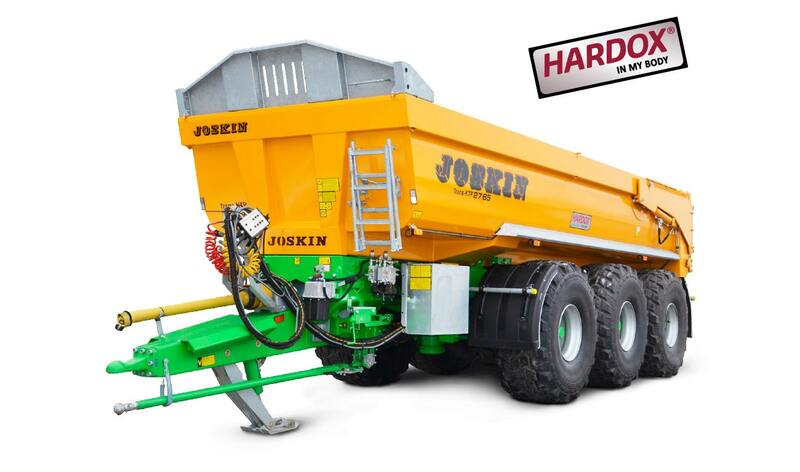 The bodies of the JOSKIN Trans-KTP construction trailers are made fully of high tensile steel of the HARDOX 450 type, which has very interesting tensile properties, as it takes its initial shape back after deformation. Compared to traditional steel, its tensile limit is indeed 4 to 5 times higher. All bodies, including the doors, are manufactured with 2 steel sheets, without any linking cross-weld. 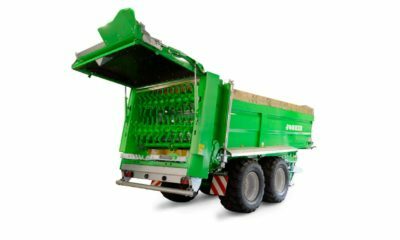 Thanks to this manufacturing process, the empty weight of these tipping trailers is significantly lower and therefore allows transportation of higher payloads, without compromising on sturdiness. 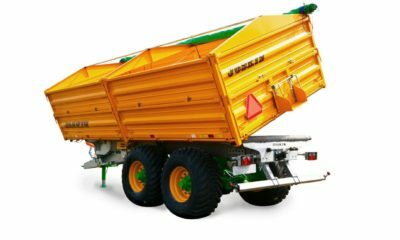 The tapered shape of the body makes sure the contents of the trailer flow out freely. This unmatched property is further reinforced by the successive folds aiming at smoothing off the edges of the body. It is also possible to choose a front tipping ram instead of the one under the body on the front part of the chassis for models 22/50 (36 l), 27/55 (49 l) and 27/65 (76 l). This option requires a galvanized headboard in order to protect the ram. 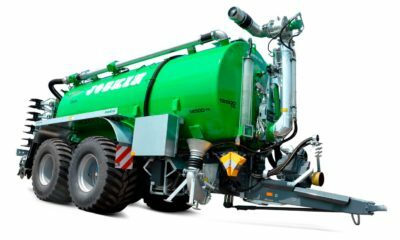 An industrial hydraulic pump (150 l/min) with electric tipping and lowering control (1,000 rpm) can replace the tipping function directly connected to the hydraulic system of the tractor. This pump has a “quick lowering” function and is part of the standard equipment on the 27/65 TRM model.